I'm really happy with my new, dark gray Joseph Abboud suit; I tried it on last night with my orange-themed tie, and I looked like a million bucks. The spousal unit says you better look like a million bucks because you spent a million bucks on it. Really, that's not what she said, but that's what she meant. I was tempted to take a selfie and post it on the world wide web, but I'm going to wait until this coming Friday, when it will have its debut. I left Cullowhee at 3:45 on Thursday, drove straight to the men's store, where I was flooded with attention (three people were taking care of me, with their tape measures out). The old guy laid out shirts and ties that in his professional opinion he thought would look good. I said no, no and no, and picked out my own tie. And all modesty aside, I look marvelous in that tie. I even stopped at a couple of grocery stores on the way home in a futile search for some Spanish dry sherry. I was home by 7:15. 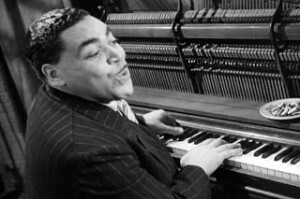 The featured song today was Thomas "Fats" Waller's "Jitterbug Waltz." We listened to the original Fats Waller side, then versions by Eric Dolphy, Miles Davis, Chet Atkins, Marcus Roberts, Bucky Pizzarelli and Scott Hamilton, and Anat Cohen. Waller wrote it the last year of his life: it came out in 1942 and by the end of 1943 Waller was dead. One of the first jazz tunes in 3/4 time, which since then has become common, but in those days 4/4 was almost the rule. Also the use of organ rather than piano was innovative. Waller loved to play organ and took advantage of each opportunity to sit down and play hymns and spirituals on the organ. I vaguely recall reading that he even once did an all night radio show playing hymns on the organ and never even identified himself. Dandy is exhausted, having been taking care of Cayo, who is seriously ailing. CCR Nation will send positive vibes her way. We have a tie on the cover contest today. Jim and Mary Ellen gave identical answers for each question, right and wrong, even made the same spelling errors. Are these guys in touch behind my back? Jim up in Maine and Mary Ellen here in Carolina? 1. Betty Everett did "You're No Good," which was a big hit for her back in 1963. The original version, by De Dee Warwick, was released earlier the same year. The question was, name somebody who has covered. Both Jim and Mary Ellen chose Linda Ronstadt, and they were right. I half expected Jim to say Van Halen, as it was covered on their second album. Other possible correct answers include Elvis Costello, Dusty Springfield, Ike and Tina Turner, and José Feliciano. 3. Lee Dorsey is covering "Games People Play," with the Meters as backing band with Allen Toussaint producing (that is a lot of New Orleans talent working together). Whose tune is it? - Joe South's. Both Dandy and Mary Ellen answered Ike and Tina. 3. Tomy Malaby & Paul Motian – What is this thing called Love?